The Park Avenue Chamber Symphony Orchestra (PACS) will honor veterans of the United States Armed Forces with a large-scale gala concert at Carnegie Hall on November 19. The performance will feature the New York premiere of Dreams of the Fallen--the much-admired new work by award-winning composer Jake Runestad and the poet and United States Army veteran Brian Turner. The work probes the way veterans are forever psychologically changed by their experiences of war. The program concludes with a performance of Beethoven's uplifting Symphony No. 9. PACS will be honoring the NYC Department of Veterans' Services, the newly created New York City agency that is dedicated to improving the lives of New York City veterans and their families. Marshaling the collective resources of the City of New York, DVS's objectives are to ensure that all veterans have permanent affordable housing and access to the support services needed to find and maintain their home; implement the VetsThriveNYC integrative health program to foster the physical, mental and spiritual well-being of veterans and their families; expand education and career opportunities for veterans through a rapidly growing network of City, public, private, and non-profit partners; and provide the human and technological infrastructure for veterans and their families to gain City-wide access to benefits, resources and care through a leading coordinated service network. Dreams of the Fallen creates a haunting sonic landscape, as the music and poetry progress through the three stages of the soldier's experience: pre-deployment, overseas service and the return. 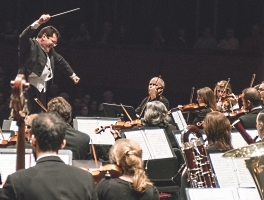 The coupling with the Beethoven is key to the whole concert experience, says PACS Music Director David Bernard, "Jake Runestad's scarring view of the impact of war on our soldiers long after they leave the battlefield, followed by Beethoven's testament to universal brotherhood not only gives voice to soldiers' struggles, but also represents our aspiration for peace," said David Bernard. "Through this concert we hope to not only honor those who have served, but also honor what they have served for; a better tomorrow." For Jake Runestad, the work underlines an important truth. "While we, the public, are familiar with epic stories of heroism and of intense loss, we hear very little about the 'afterwards' of the war experience," he says, "thousands of veterans struggle to assimilate back into everyday life after living through a traumatic wartime experience. We hear very little of the continued struggles that these soldiers face and so I hope to shine a light on their stories with this new musical work." Led by David Bernard, the orchestra will be joined by the leading pianist Jeffrey Biegel, soprano Kristin Sampson, alto Edith Dowd, tenor Cameron Schutza and bass David Leigh. A vast chorus of 200 voices will be comprised of the vocal forces from the West Point Glee Club, New Amsterdam Singers and Young New Yorkers Chorus. Terrance McKnight, WQXR Evening Host, will host the event. The concert takes place at 8 p.m. on Saturday, November 19 at the Stern Auditorium / Perelman Stage at Carnegie Hall. Tickets will be available for $18-$250 at CarnegieCharge (212-247-7800), at the Box Office (57th Street and Seventh Avenue), and at carnegiehall.org. Musica Viva NY--a chamber choir of thirty professionals and highly skilled volunteers dedicated to creating imaginative programs that offer joy, solace, renewal and inspiration in a busy world--presents "Heroes and Dragons: J.S. Bach and the Epic Cantata" on Sunday, December 4 at 5:00 p.m. at All Souls Church, 1157 Lexington Avenue (at 80th Street), New York, NY 10075. "Heroes and Dragons" features Musica Viva NY in Bach's four "Michaelmas" cantatas, illustrating a great battle in heaven and joined by the Aeolus Quartet and some of their musical colleagues. The "Cantata for the Feast of Saint Michael," "Man singet mit Freuden vom Sieg" (One Sings with Joy Before the Battle), BWV 149, highlights Musica Viva NY soloists soprano Shabnam Abedi, mezzo-soprano Barbara Fusco, countertenor Andrew Troup, tenor Nathan Siler, and baritone Joseph Beutel. The other three cantatas on the program include "Es erhub sich ein Streit" (There Arose a War), BWV 19, "Nun ist das Heil und die Kraft" (Now is Come Salvation and Strength), BWV 50, and "Herr Gott, dich loben alle wir" (Lord God, We All Praise You), BWV 19 with Musica Viva NY soloists soprano Devony Smith, alto Chloë Schaaf, tenor Nathan Silver, and bass-baritone Andrew Moore. Also on the program is Bach's Toccata and Fugue in D minor, BWV 565, performed by organist Renée Anne Louprette, and Knut Nystedt's "Immortal Bach"--his arrangement of Komm, Süßer Tod, BWV 478. Tickets, priced at $30, are available by visiting http://musicaviva.org/tickets/ or at the door on the evening of the concert. The NoHo/East Village based Sheen Center for Thought and Culture is proud to announce their inaugural 2016 Fall Classical series made up of three unique concerts that run the gamut of classical chamber music. Curated by Marc Kaplan of SubCulture, the opening concert on November 22 brings together Argentinian pianist Pablo Ziegler and pianist/host of NPR's From The Top Christopher O'Riley to perform a program from their new Steinway & Sons album Tango Nuevo. The second concert, December 13, honors the 150th birthday of Erik Satie with a multimedia performance featuring pianists Anthony de Mare, Simone Dinnerstein, Conrad Tao, and Adam Tendler along with Tony Award-nominated actor Lou Liberatore. A final January 12 concert, also curated by Kaplan, rounds out the season with a performance by the Parker Quartet and clarinetist Charles Neidich, playing chamber music by Mendelssohn and Brahms. Some music just won't be pigeonholed, including the collection of compositions presented in Sonus Inenarrabilis. To do justice to this adventurous and haunting melding of diverse influences, you have to apply the immortal Duke Ellington's highest compliment: "It's beyond category." New Century continues its 2016-2017 season November 10-13 with debut performances by Australian/Taiwanese violinist Ray Chen. Marking only his third appearance in the Bay Area, Chen leads New Century as guest concertmaster and soloist in a program that features Mozart's Divertimento in F major and Violin Concerto No. 3 in G major, alongside Elgar's Introduction and Allegro and Britten's Variations on a Theme by Frank Bridge. Winner of both the Queen Elisabeth (2009) and Yehudi Menuhin (2008) competitions, Ray Chen has appeared as soloist with some of the world's leading orchestras including the London Philharmonic, National Symphony and the Orchestre National de France. In 2011, he made his Bay Area debut as soloist with the San Francisco Symphony and returned in 2014 to perform in recital at San Francisco Performances. Most recently, he made his debut appearance with the BBC Symphony at the BBC Proms in July 2016 with "sensational style" (The Times, UK) in a performance of Bruch's Violin Concerto that was "rich, impossibly smooth and shimmering with passion" (Express, UK). Chen is the first classical musician to be invited to write a regular blog about his life as a touring soloist for the largest Italian publishing house, RCS Rizzoli. His online presence has generated a huge following of a younger generation of classical music fans through the use of multiple social media platforms, further strengthening his goal of expanding the reach of classical music to a much wider and more diverse audience. "Ray Chen Leads" will be given on four evenings in different locations around the Bay Area: Thursday, November 10 at 8 p.m., Berkeley City Club, Friday, November 11 at 8 p.m., First United Methodist Church, Palo Alto, Saturday, November 12 at 8 p.m., Herbst Theatre, San Francisco and Sunday, November 13 at 5 p.m., Osher Marin JCC, San Rafael. New Century offers an Open Rehearsal Wednesday, November 9 at 10 a.m., Zellerbach Rehearsal Hall "C," San Francisco for a price of only $15. The Open Rehearsal will offer a sneak preview of the concert repertoire while allowing audiences to experience the musical democracy of a rehearsal without a conductor. The Attacca Quartet Presents "Recently Added"
The Attacca Quartet are excited to announce "Recently Added," a new series exploring the string quartet works of contemporary composers. Each year, the Attacca will select three living composers they feel have made significant contributions to the repertoire, and will celebrate their work by performing their complete string quartets. Season one will take place at National Sawdust in Brooklyn, NY, featuring the music of Caroline Shaw on December 11 at 5PM, Michael Ippolito on February 19 at 8PM, and John Adams, whose complete works the group recorded for their acclaimed Fellow Traveler album, on April 2 at 3PM. In the last year, Rachel Podger has won the BBC Music Magazine Concerto Award for Vivaldi's L'Estro Armonico. She's been dubbed the "queen of the Baroque violin" by The Sunday Times. And she has won the Gramophone Classical Music Award's Baroque instrumental category for her recording of Biber Rosary Sonatas on Channel Classics. Rachel is clearly on the world's "A List" of truly great Baroque violinists and we are fortunate to have her join us in November to lead the orchestra for our Vivaldi and Bach program, which also includes works by Tartini and Veracini. Rachel and the Orchestra will perform a variety of violin concertos exploring different Baroque era styles and forms, and she will lead the Orchestra in the first orchestral suite written by J.S. Bach. This concert will be a veritable feast of Baroque violin, led by a true master. Join us next week to see the esteemed Young People's Chorus of New York City perform the following and other world premieres from six of today's most distinguished composers. Inspired by a fourth century Eastern Proclamation chant, Charles Wourinen links the music of the past to a vision of a rich musical future. Described as a "maximalist," Wourinen's music is lyrical, luxuriant, expressive, and strikingly dramatic. This new work is characterized by powerful harmonies and elegant craftsmanship, supported by accompanists Jon Holden (piano), Sam Jones (trumpet), and Dave Nelson (trombone). From "As soft as a porpoise, As strong as a gale" to "As gentle as caring, And as sad as adieu," the transcendent Young People's Chorus of New York City will take you on a musical tour of 176 similies from Norton Juster's poem A Surfeit of Similes set to music composed by Robert Xavier Rodríguez, accompanied by Jon Holden (piano).